Gartner predicts that 80% of worker tasks will take place on a mobile device by 2020, increasing the momentum to adopt UEM as a single endpoint console. What Is Unified Endpoint Management? UEM refers to a new class of tools that can act as a single management interface for mobile, PC and other devices. 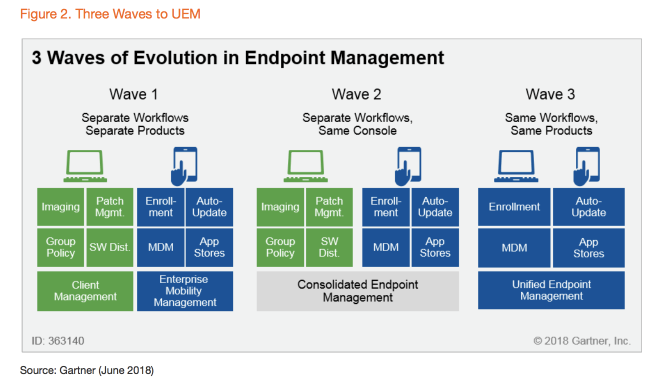 According to Gartner, I&O leaders should expect and plan to replace enterprise mobility management (EMM) and client management tools (CMT) with UEM to support modern OSs. Configure, manage and monitor iOS, Android, Windows 10 and macOS, and manage some Internet of Things (IoT) and wearable endpoints. Unify the application of configurations, management profiles, device compliance and data protection. Provide a single view of multi-device users, enhancing efficacy of end-user support and gathering detailed workplace analytics. Act as a coordination point to orchestrate the activities of related endpoint technologies such as identity services and security infrastructure. In 2018 Gartner revealed a new Magic Quadrant which ranks vendors for Unified Endpoint Management. 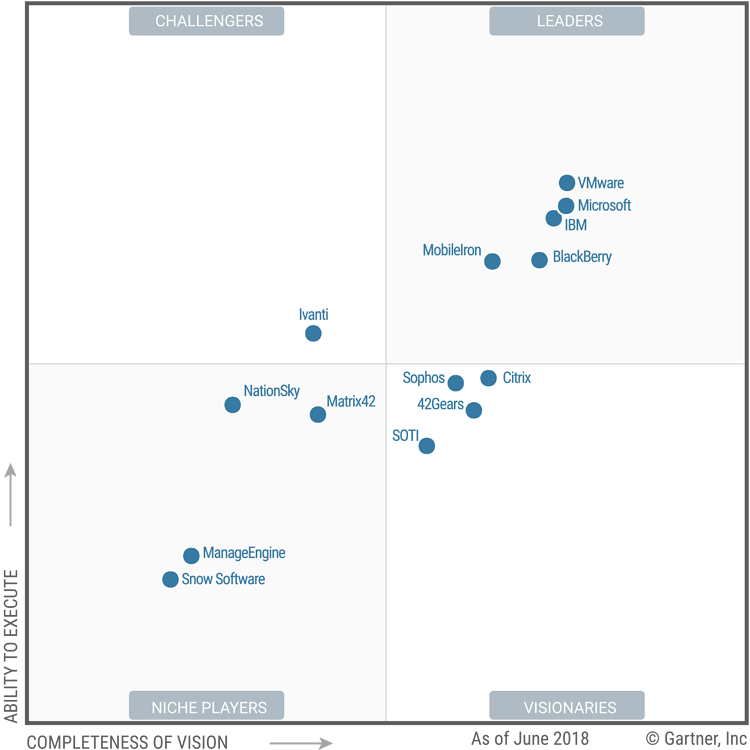 This replaces the previous Magic Quadrant for Enterprise Mobility Management. Gartner made the change in response to its assertion that leaders managing increasingly diverse endpoints want to simplify the many tools, processes and policies that span their device environment. "As UEM technologies mature, a viable option for a single-pane-of-glass solution is emerging. We expect our market definition of UEM to evolve over the next several years as the readiness for and embrace of UEM management become more commonplace." The main difference between the 2017 Magic Quadrant for EMM and the new 2018 Magic Quadrant for UEM is the rise of Microsoft Intune. 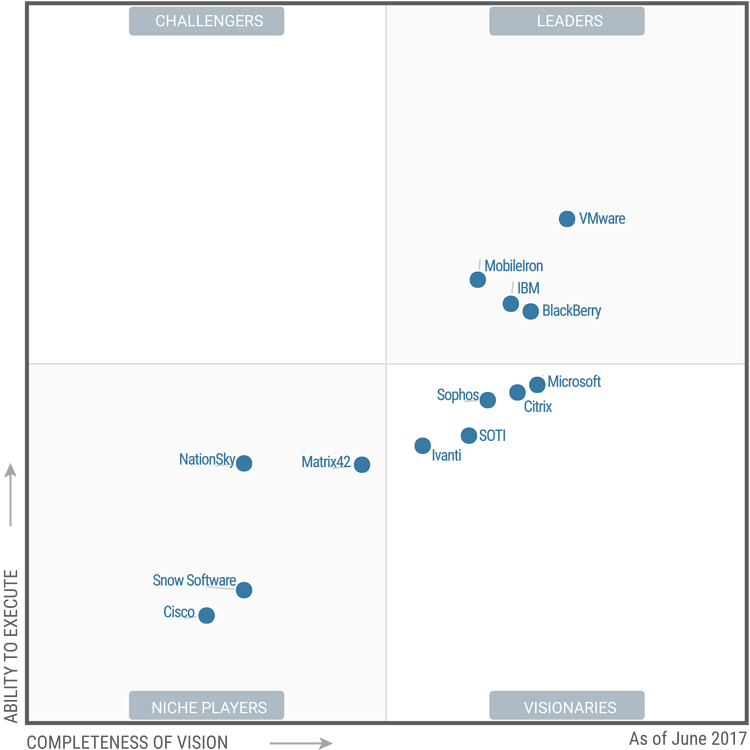 The Microsoft suite has leapt from the Visionaries box in 2017 to a leadership position just behind VMWare in 2018. Gartner cites client interest in Intune/EMS is demonstrated by a noted increase in the number of Gartner clients that are implementing or have implemented it in 2018. Increased awareness through concerted Microsoft sales and marketing motion, continued product improvements, and growing adoption of both Office 365 and Azure Active Directory deployments contribute to significant pull-through. Intune is appropriate for organisations that are looking for fully integrated ConfigMgr workload management alongside UEM, that require application-level management for the Office 365 mobile apps, or those looking to standardise on Microsoft tools and utilise existing EA entitlements. Gartner has identified the migration of PC management to unified endpoint management as a key strategic imperative for companies. They have identified three waves of adoption with timelines based on an organisation's aggressiveness in tech investment. Gartner has ranked organisations as Type A — those that are most aggressive in their adoption of new technology, Type C organisations — those least aggressive in adoption of new technology, and Type B organisations, which fall in between the two and make up the bulk of enterprises by percentage, currently exhibiting a mix of approaches. Gartner predicts that Type A organisations will be adopting UEM tools in 2018, while Type C organisations will not move to UEM until 2022. Type B organisations The evolution of endpoint strategy is taking place in waves, and Gartner sees the majority of organisations will fall into Wave 2. "Most Organisations Should Pilot UEM Today for Future Adoption"
Companies with a device estate that can only be managed using UEM tools; such as organisations heavily reliant on Apple macOS, Google Chrome OS or Windows 10 S.
IT organisations that have completed a modernisation of their critical user-facing apps and therefore are not bound by legacy software dependencies or legacy management scripts, processes and tools. Organisations supporting user populations where the main computing device is: mobile, like an iPad or Android tablet, or other non-Windows devices, such as Chrome OS devices. The majority of organisations will not fall into these limited scenarios, says Gartner, but will still need to take action. Leaders in endpoint management need to include UEM capabilities and use cases in the set of requirements used to evaluate vendors. They should also audit the current endpoint management tools and their ability to grow with the organisation. Piloting alternatives if UEM capabilities are absent, will shorten and simplify the migration when a move to UEM is appropriate, recommends Gartner. Why do Australian companies need a mobile phone policy?